As some of you might recall, I had purchased an older Clos Vougeot (maybe 1991? 1994?) at MacArthur Beverages in DC. I had been excited about that one, but drinking it revealed that it was past its prime and had been on the decline for a while. I found out after the fact that Clos Vougeot, though a grand cru vineyard, encompasses a large area, much of which is not, in the opinion of many wine critics, truly grand cru level. So when the wine rep at North Berkeley Wine Imports steered me toward yet another Clos Vougeot, I hesitated for a moment (obviously, my bias is wildly unfair, but perhaps more understandable given the price points). 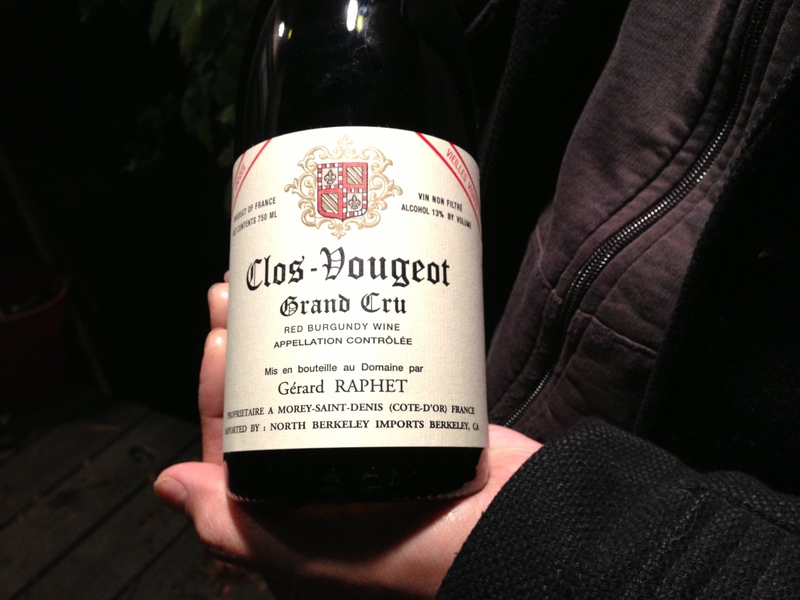 But she was insistent that Raphet was a fantastic producer and that this particular Clos Vougeot would be magical. Thank God I gave it a second chance! Fortunately, I wasn’t alone for this wine. I had it with my friend James and two of his friends out in Rockridge. These particular friends lived in a cottage which was hosting another friend (not present) and his cat, and because both James and I are ridiculously allergic to cats, we drank while standing on the front porch, which added to the charm. This wine was gorgeous. I opened it a few hours prior at Trattoria Corso (to let it breathe), and the first traces of its bouquet escaped, reminding me of catching the scent of a beautiful woman’s perfume. This initial impression was confirmed later: the nose was tremendously complex and yet fragile, in a way. It was full of lavender, spice, a trace of earth, and already the first sign of bottle age. This wine had an extraordinarily elegant mouthfeel, light and silky, yes, but also possessing very fine tannins that, while noticeable, belied structure and grace rather than mere oak. In the mouth, cranberry, green herbs, stone, and even, interestingly, a trace of freshly-cut green apple. Long finish and very satisfying resolution. I won’t have the opportunity to have this particular wine–or very many other grands cru–anytime soon, but if you do, don’t turn it down. Seek it out, or seek out any of Raphet’s other wines. Apparently, they are also all excellent.